The high school football team in Newtown, Conn., is 12-0 this season — a season dedicated to the 26 victims killed in the mass shooting at an elementary school in the town last year. Until recently, the team faced the possibility of playing for the state championship on the anniversary of the massacre. 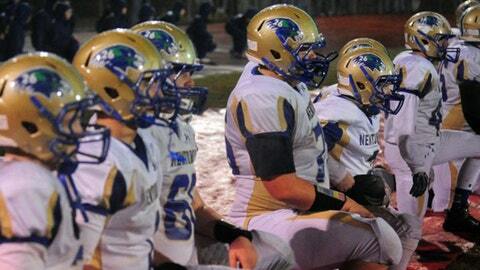 The Newtown Nighthawks will avoid that overlap. The governing body for school sports in the state, the Connecticut Interscholastic Athletic Conference, announced Monday that it approved Newtown High School’s request to hold the Class LL title game on Dec. 13 instead of Dec. 14 if Newtown reaches the championship. Newtown High is the top-ranked team in the Connecticut Class LL playoffs after completing a perfect regular season with a 42-7 win over rival Masuk last Tuesday night. On Dec. 14, 2012, a gunman killed 20 first-graders and six adults at Sandy Hook Elementary School. Adam Lanza, 20, also shot his mother to death earlier in the day and killed himself at the school as police arrived. The Nighthawks will host 9-2 Ridgefield on Tuesday in the quarterfinals. If they win, they’ll play in the semifinals Saturday at a location to be announced. The finals will be held Dec. 13-14 at Central Connecticut State University in New Britain. The lineups for the finals are usually scheduled after the semifinals, but Newtown wanted to make sure it wouldn’t have to play Dec. 14. "The football committee did feel that due to the sensitivity surrounding the Newtown events … if the school reaches the finals it’s appropriate not to ask them to play on that anniversary date," said CIAC spokesman Joel Cookson. 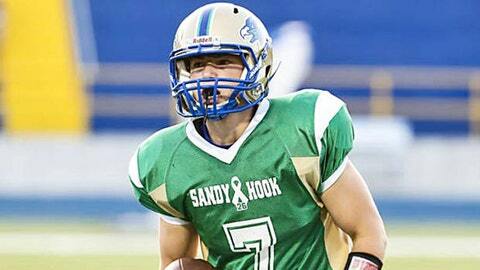 Newtown’s football coach, Steve George, didn’t return a message.